Set in an evolving sci-fi world, Warframe is a free-to-play cooperative third-person shooter video game developed by Digital Extremes for Windows and Playstation 4. In the game you will play as a Tenno Warrior equipped with an amazing armor with unique properties, called Warframes in the war against the Grineer and Corpus. Players can choose 13 different types of Warframes, each one with its own strengths and weaknesses and four unique powers. The Warframes are equipped with regenerating shields while allowing them to use special abilities such as higher jumping heights, control over elemental forces or faster movement speed. These powers can allow players to cast virtually anything, ranging from devastating waves of energies to defensive barriers, or even mass healing. 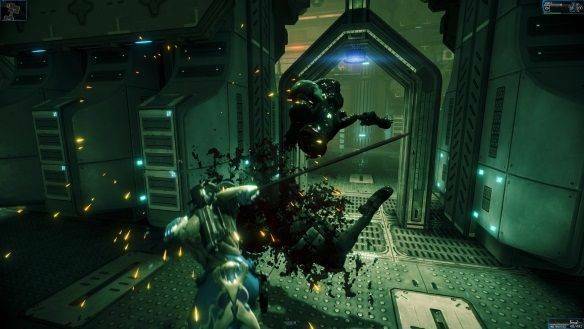 In addition, the Warframes augment the physical abilities and improve natural skills like swordsmanship, marksmanship and most notably acrobatics. You can improve them with add-ons like helmets or modules, which may be installed to alter their abilities and boost certain attributes. In Warframe, you can play together with 4 players to complete missions such as eliminating enemies or retrieving data from terminals as you complete more missions, you will eventually unlock new regions of space to explore, and gain access to powerful Warframes and Weapons. In these missions players will battle enemies and collect resources, credits, and affinity for their equipment.